When watching a video file you may really enjoy the audio, but don’t necessarily need the video on the file. If this is the case you can take just the audio from the file and save it as its own specific audio file with M4a to MP3 Converter Free. It allows you to load a video file and then convert it to an audio file like MP3. Extracting audio from video is useful if you want to listen to the music from the video on a portable audio player. 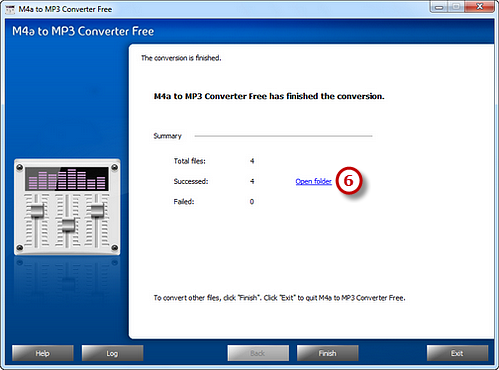 Launch M4a to MP3 Converter Free and click “Add File(s)…” to add video files to the conversion window. You are allowed to add a large quantity of video files to be converted. 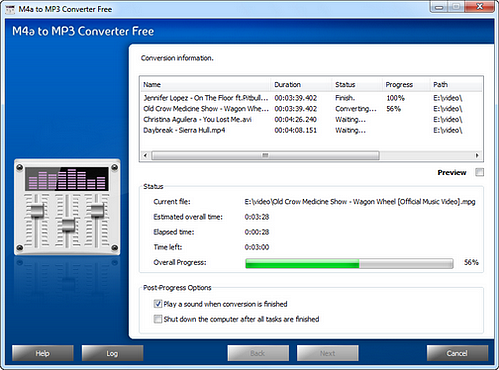 With the conversion window, you can see the detailed information of the added files. If needed, use “Delete” or “Clear” button to remove the unwanted files and “Move Up/Move Down” button to change the order. There’s a “Play” button to play the selected file with the media player in your system. Click “Select…” to choose an output folder from your computer to store the output files. 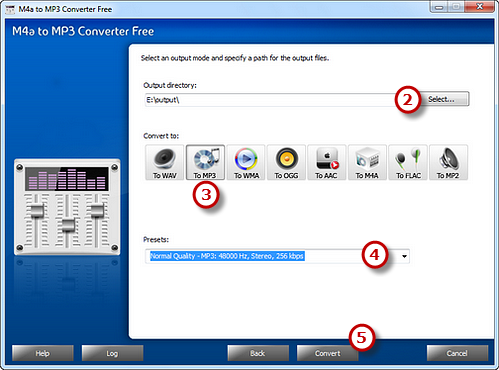 Choose an output format from WAV, MP3, WMA, OGG, AAC, M4a, FLAC and MP2. Then, adjust the format presets in the “Presets” dropdown list if more precise output quality is required. Click “Convert” to start conversion.